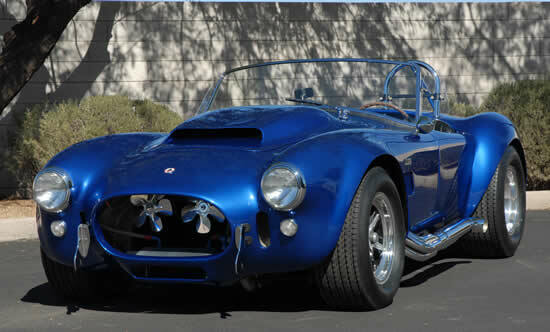 One of only 23 competition built 427cid Cobra's. Only one of two "super snake" versions which means it was a street legal competition model cobra. These cars are distinct as they have a different nose and hips from the standard cobra. This car was CSX3015. It has approx. 800hp. The Dodge Firearrows were a grouping of four one-off concept/dream cars designed by Chrysler's legendary design chief Virgil Exner and built by Ghia of Turin, Italy. The series consisted of a full scale mockup (Firearrow I), THIS CAR Fire II a running, driving fully roadable car based on that mockup. Firearrow III a sport coupe, a further evolution of the earlier Firearrows and finally Firearrow IV, a fully roadable convertible with folding top, windows and fully designed and engineered to be translated into series production. These cars are the only survivors of the wonderful early series of Chrysler concept cars that were designed as serious, elegant Italian styled sports cars which could very easily have found a market niche to compete with the Corvette, Thunderbird and several European marques. 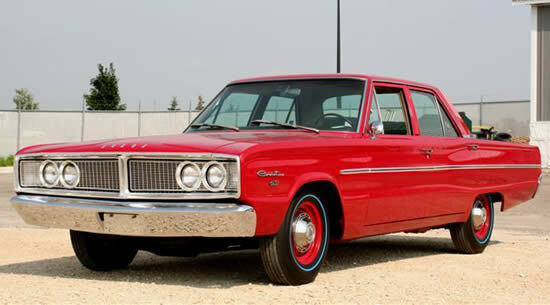 They not only are wonderful looking cars, but are powered by the legendary Hemi engine and a pleasure to drive. 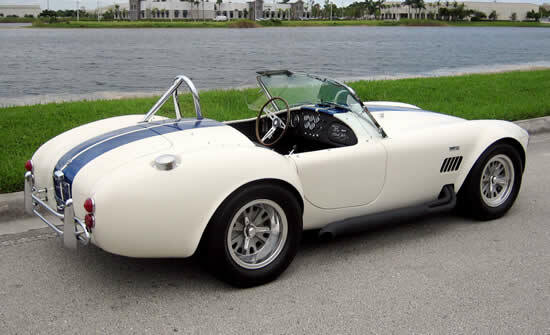 This super rare AC Cobra #3301 is the first car in the third group of 427 Cobra production, 3301 was completed at AC cars on 9/1/1966 for delivery to Ford advanced vehicles in Slough, England. As it was neither shipped nor invoiced to Shelby American. This was one of only two 427 cars invoiced to Ford Advanced vehicles and used for show and track purposes. Its first owner after FAV was located in Paris, France and this car remained there until 1977. CSX 3301 is listed in the Shelby World Registry where all of its history is documented. No expense spared restoration just completed. Only 10,000 original kilometers are on this pristine automobile. Pictures of the original ledger at AC cars proving its authenticity. This Camaro is one of the rare ZL-1 427 cu. in. Allum. Motor Factory race cars. This car retains its original 427 block and its known that there is only a hand full of cars that still have the original block This car was a race car in its early life and was tubbed and roll gage was installed. the restorer replaced all the body panels from the firewall back to restore it to original condition and keep the integrity of the car. this car comes with the Copo connection certification and is #51 on the ZL-1 list. 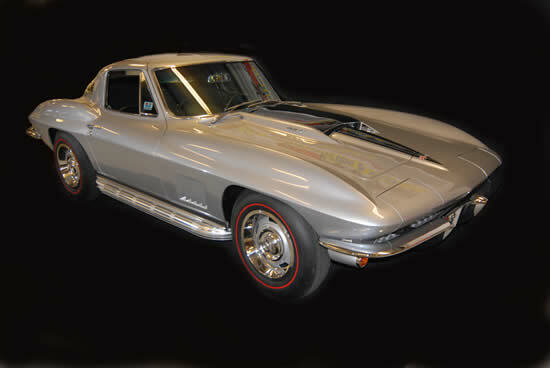 The "Last" Corvette Sting Ray, VIN #22940, is powered by a 427cid/390hp V8 with a 4-speed transmission, power steering and factory air conditioning. Documented with its Tank Sticker this piece of history has been the recipient of a professional frame-off restoration. Featured in a six episode television program on SPEED that has followed this car from restoration to being offered at No Reserve at Barrett-Jackson. Awards: Multiple NCRS Top Flight certifications, Bloomington Gold certified, Vette Fest Gold Spinner award, Vette Fest Triple Crown award, Meadowbrook Concours De Elegance Lions award, and Corvette Expo Excellence award & Most Significant Corvette award. Memorabilia: All awards, trophies, certificates, judging sheets, owner history, factory documentation (build sheet), books, manuals, magazine articles will go to Buyer. Also, buyer will receive items donated from: Dana Forrester (Artist), the illustrated Corvetter Print series, M.F. Dobbins (author), Auto ect. neon clock, NCRS membership plus care package), Meguiar's (wax and car care products), Michael Bruce and Associate (author), ET graphics (last Corvette apparel), DVD of last sting Ray six episode speed TV programs. 1971 Plymouth "Cuda"- generally considered "The Best Street Machine Ever." Built by Alan Johnson of Johnson's Hot Rod Shop- Gadsden, Alabama. All aluminum 572 cu.in. dry sump Hemi. 2 stage adjustable direct port nitrous, one off fuel injection system, custom one off chassis, ceramic coated titanium brakes, 6-speed- Getrag Transaxle, one off 20" and 19" real knock off wheels, carbon fiber front fenders, hood, spoilers, interior pieces. Over 16,000 man hours invested, very streetable. SEMA 2005 & 2006, Cover Car Super Rod & Popular Hot Rodding Magazines, largest articles ever written in both magazines, Cover of The Charlotte "Barrett-Jackson Road Show" Brochure and the 4th issue of The Barrett-Jackson Experience. Street Machine Australia, and several other magazine articles, Catalog & Brochure Car for numerous Vendors, Goodguys Street Machine of the Year 2006, Shades of the Past Post 48 2006 Car of the Year, Chrysler Design Award 2005 SEMA, Mother's Shine Award, Chip Foose Best of Show Pick @ Braselton Bash, Boyd's Pros pick- Builders Showcase NSRA Louisville Nationals, Nitto/Popular Hot Rodding 2007 Calendar Cover Car, Cover Car & Monthly Car for Flow Master 2007 Calendar. See www.barrett-jackson.com Lot 1290 for link to build photos. Best of the Best! This is possibly the best 1971 HEMI 'Cuda that the factory ever produced. It is GY3 Curious Yellow with factory black billboard stripes and a HEMI 4-speed manual transmission. Curious Yellow is the most desirable color ever used on any '71 'Cuda. A rotisserie restoration was finished in 2006 using original and NOS parts. Only three '71 HEMI 'Cudas were originally painted Curious Yellow, two 4-speeds and 1 auto. This is the only 4-speed that came with factory billboard stripes. It has 16K original miles. The original matching numbers engine has been visually inspected and documented by Galen Govier. This car is listed in Galen's Chrysler Registry. This Hemi 'Cuda was special ordered and delivered new in June of 1970 by Bill Reardon of Clarksburg, WV. Upon it's delivery from Shreves Plymouth-Dodge Bill drove his new factory race car the 28 miles home. Bill was 62 when he finally got his "race car". He immediately set out to make it even faster. Bill removed the 2x4 intake, the complete exhaust system, rear third member, the rear wheels and tires and the front shocks. He replaced them with the best high performance parts of the day and paid special attention to see that none of the factory parts were misplaced or damaged. The first race season Bill made some 30 passes at the 3 local drag strips. He had a good first season with some times in the high 10 second range. At the end of the season he garaged his "race car" and began to prepare for the next year. That winter Bill Reardon passed away suddenly. In 1977 Bill's widow passed away. The Reardon's son was left to dispose of the estate and placed an ad in the local paper. Marvin Dillion is the sole person responsible for the salvation of this great car. After seeing the car and agreed to pay the price of $3500. Marvin took his new found love home and immediately began replacing the "hot rod" parts with the original parts that she was born with. In 1993 Marvin sold the car, Marvin purchased this car with 42 miles on her. Even through the odometer turned to the 43 mile mark as he moved her from time to time he did not put a complete mile on this car for the entire 16 years he had her. Passing through 3 more owners and the miles stayed low until 2005 when renowned, internationally known "Hemi builder" John Arruzza of Thomasville, NC bought her with 61 miles on her now and was in need for him to make her run and perform as she did when new. John performed the tune up and fluid changes that a stored car needs and rebuilt both of the carbs so she could once again roar to life at the turn of the key. John test drove her to the mileage of 73 and since then she has been moved enough to come up to the 74 miles that are on her today. John still has the Ziplock baggie that contains the rubber he burned off the tires on his test drive and she sits here today ready to go. 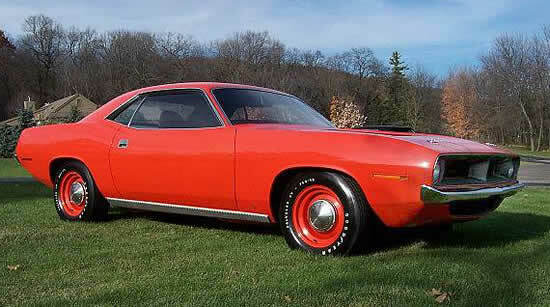 This is the lowest mileage hemi "Cuda known to exist and perhaps should stay that way. She comes with complete documentation including the original build sheet and has all known numers documented, recorded and verified. Here is truly the definition of a survivor, muscle car. Built as one of the last 10 hemi "Cudas of 1970.